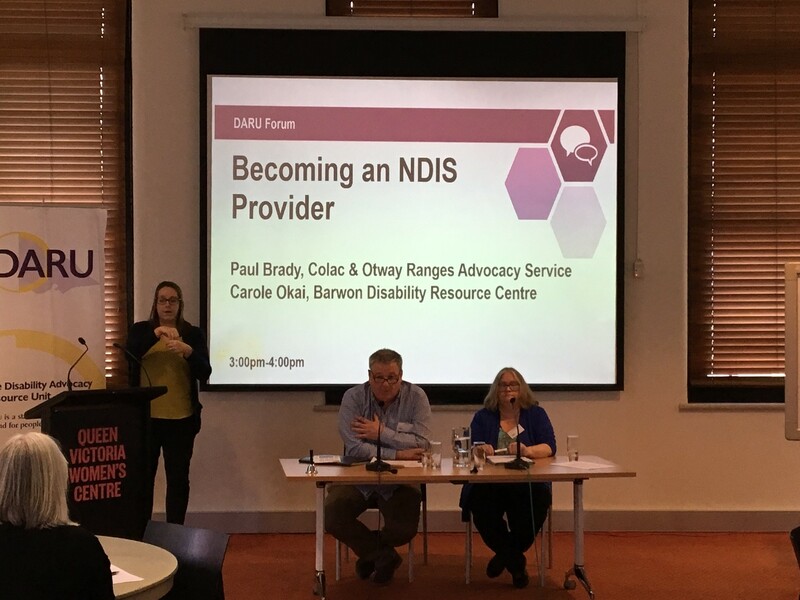 Paul Brady, Coordinator at Colac and Otway Ranges Advocacy Service (CORAS), and Carole Okai, Executive Officer at Assert 4 All, stepped us through the process of becoming an NDIS Service Provider. Both advocacy organisations have undergone this process and have been operating successfully in the NDIS Barwon trial site. For our last session for today we have two very generous people who have come down from the Barwon Region to travel down and speak to us today about the process of becoming an NDIS provider. We have Paul Brady and Paul is from the Colac and Otway Ranges Advocacy Service. We also have Carol Okai and Carol is from the Barwon Disability Resource Centre. Paul and Carol will tell us about their organisation and what the process was in terms of becoming an NDIS provider and also how to manage the conflict of interest that may arise. When they have finished they’re happy to take questions off the floor. Over to Paul and Carol. Thank you very much I hope people don’t mind if we just sit at the table. Because there is two of us, we will probably interject each other and have something to add to each other’s presentation. So if it’s okay with everyone, you’re happy for us to sit here. My name is Paul Brady. I’m with the Colac Otway Region Advocacy Service. We operate over at Colac, which is about 150 kilometres southwest of Melbourne. As well as Colac Otway Shire we cover the Surf Coast Shire. We’ve got a pretty broad region to cover as far as distance is concerned. Also we were part of the Barwon trial site for the NDIS. We were on the end of the site actually. Probably you would say we’re the more rural or isolated section of the trial site. We come into it like you people are now, without a lot of information about how the NDIS was going to work. It was very confusing, very daunting and I guess as the trial went on we’d seen three of four different changes to the actual way the NDIS was delivered and as it is today. There has been a lot of trial and tribulations. A lot of misunderstanding and I think for the advocacy organisations such as ours and Carol’s, a lot of work. We found when the NDIS rolled out initially, they only targeted people who were on the DHS Register. They bought the people who were on the register onto the scheme first and they did that over a period of time. They were looking at age groups, I think they bought the children on first and then they went through various types. Believe it or not the people that lived at Calandra Institution were the last to come online, which was a real shame. You would’ve thought they would’ve been first cab off the rank but that’s the way they did it in the early days. What we found in the early stage when the participants were going to have their plans done, NDIS thought it would be good to have the participants there on their own so they weren’t going to be influenced by any service providers or case manager who may have went along with them. As you know we were all daunted by the process and when the potential participants were going in for their meetings they weren’t really putting across a whole story. All the people were used to getting was a 9 to 3 day program and perhaps a little in home support. It became obvious pretty quickly that people needed support in the plans and they turned to the local advocacy organisation, which was us. Which was great. It gave us an opportunity to get in there and support the participants but it certainly put a lot of pressure on our service. We only had 1.2 advocates and we found that we were absolutely inundated with requests for support to the point where it virtually absorbed the whole output of the service was basically taken up with supporting people through that process. It became evident very quickly that there was a lot of people not being picked up by NDIS. These are the people that weren’t registered with DHS that had disabilities, either had mental illness or other type of disabilities, physical disabilities that were also eligible for this scheme. We also found ourselves being inundated with people who wanted assistance to get onto the scheme, which meant a lot of paperwork, form filling out and even accompanying people to the Doctors and what not. It became a real burden, a real onus on our organisation to the point where we couldn’t staff the demand and to be quite honest we were working over and above what our funding levels were. It nearly sent us broke to the point where we were really facing insolvency. As an organisation we had to come up with some ideas that perhaps how do we continue to provide advocacy but also how do we cater for the extra burden that the NDIS had put on us, I shouldn’t say burden, extra demand it put on us to provide support for people. The initial days the support connection was being done by the service providers. Again, there was no changes being implemented. The service providers were I think it was said before, they were saying their product was the best so they were encouraging their existing clients to stay with them. We didn’t see any change at all. People were coming to us again for advice to help them sort through their plans and try and sort some issues out to try and get their plans implemented. Again, it was more strain on the organisation. My good friend here, I had a discussion with at a meeting in Geelong. Carol was finding the same with her organisation. She’d already made headway into becoming registered with the NDIS to provide support coordination as it was back those days. She was encouraged to do so by demand and being a little bit different to our advocacy organisation, where we only provided individual advocacy, BDRC who Carol will tell you about in a minute, provide a range of different information and advocacy services. It fitted pretty well with Carol at the time and she had already started the process of being registered as a service provider. We had a discussion about the conflict of interest. I took it back to our board. Our boards shared information and we see it as a great opportunity to be able to empower people to make choices and help them make choices. What we did was we decided that we would start a subsidiary business of Colac Otway Region Advocacy Service and call it CO Connect and it was purely to run separately from NDAP funding and it was to be staffed purely by the income that was created by the NDIS. There was born CO Connect which was our NDIS Support Coordination Program. When I say it was born there was a lot of work to go in the application. In the application you had to prove you had the ability, had the expertise in your organisation to deliver the service. We had to prove that if there was a conflict of interest that arose, how we would deal with it and how we would work through that. Thank fully I must say there hasn’t been a conflict of interest arise nearly in the 2 years we’ve been doing it. But we did put mechanisms in place to ensure if there was a conflict of interest that it would be dealt with and dealt with swiftly. The other thing most important to us was it didn’t impact on what we were delivering with our NDAP funding. In fact we found it enhanced our service provision because it took a lot of financial stress off what we were paying through NDAP with things like administration, rents, travel, phone and all that. That’s where we became CO Connect, which was about 18 months ago. That was the history about us getting kicked off. I will hand over to Carol, she can tell you about that and then we can go into pros and cons, how the nuts and bolts work. I’m from BDRC Barwon Disability Resource Council. I only realised as I was sitting here we were the actually first funded organisation in Victoria, in 1975. We’ve also just now I realised we were the first organisation to provide these supports in Victoria under the NDIS. It’s sort of fitting that it was us and that was by accident in that it could’ve been any other organisation if the launch site had been elsewhere. BDRC over the years and I’ve been there 19 years and counting, I expect a watch or something next year or at least a cake. We’ve provided services for advocacy and then we’ve also provided the disability support fund, which is a fund that provides support for people with mental illness. We’ve done access maps and directories, other projects, systemic advocacy. For us we’ve been more than a disability advocacy organisation. We certainly never entered into service provision at all. We started up an arm, a bit like what Paul is talking about called Green Pie, plan management. That’s our little flyer. We’re providing support connect, coordination of support, financial intermediary and service intermediary. Most of those supports will fit into those two clusters that Catherine discussed earlier. I actually do have a handout on the support connection. The categories that Catherine talked about, so it’s here if anyone wanted to help me and hand it out. Thank you. It just might help for people to read it. We find the NDIS it’s a whole new language. They’ve changed a lot of the terms. A lot of the things we talk about in advocacy are really the same things it’s just with different words. That might be helpful. All of that of course is available on the NDIS website. As Catherine said they’re changing their price list as of 1st July and I’ve really got to get a bit more information on that. I want to have a look and see if they’ve changed anything else as well. Probably for us, we did all the organisational things that Paul talked about. It was taken to our board of management, it was considered very seriously. We examined all the pros and cons of entering this kind of work. We also have a financial imperative in that we were looking at the disability support fund was looking at not being funded anymore. Really to survive as an organisation and to provide the supports that individuals were asking us to provide. We had individuals in the community ask us are we going to do that. I suppose if you look at support connection and look at time-limited assistance to strengthen participant’s ability to connect with informal, mainstream and funded supports, that’s very close to advocacy. That’s very close to what some of us already do. The other areas are more complex. When Catherine talked about the prices, the per unit cost, the hourly rate, that $55.00 one at the moment that’s a support connection. Then you go on to other supports so coordination of support is $90.00 odd I think Paul. Then the more specialist one. They’re the type of things we’re talking about and we also help participants manage their plans because if we don’t do this kind of work service providers are going to do it. We feel that we come from a rights based perspective. We come from advocacy. We think that we can run this division. For us it’s two different divisions under our organisation. We feel we can run alongside but we can still maintain our ethos, our philosophy of the organisation and empower people and talk about their rights and choices in a way that service providers cannot and never will be able to. That’s where we feel, that’s our perspective, that’s why we’re there. It can support our organisations to deliver advocacy because I think we talked about, I think Catherine talked about that as well, we might be able to provide advocacy for the more complex supports in our community – abuse and neglect, child protection issues, all those things that the NDIS won’t cover. But if we can get some of this support connection stuff covered under the NDIS then our advocacy funding can be used in a better way. In a way that will support clients who really need it because I don’t know about you guys but we’ve still got a wait list. We’re hoping at some point in the evolution of the NDIS that our wait list will start going down and we will be able to concentrate on those cases that really require a lot of advocacy work. Sometimes months and years. I might hand back to Paul. So with the support connection arm, the CO Connect arm we have four staff that work in that arm. They’re all casual staff. Since its implementation or since our initiation of CO Connect we’ve seen a lot of change happen within the service system, within the area we work in. Because people aren’t locked in by having their coordination supports done by the service provider we’re able to go out and look for new opportunities, negotiate new opportunities and initiate change from what people were used to in the last 30 to 50 years in their daily lives. We’ve seen some fantastic things happen. People are now exercising choice and control. Because we’re independent and a service provider we’re able to have a real objective look about what’s out there for people. It may not be in our own community, we have to look outside the square. People have actually relocated because of our support to Melbourne and from our perspective bigger place like Geelong. It’s created change. It gives it a bit more purity I guess from the perspective that we have no alliance with any other service provider. It is a good fit in that regard and as Carol said, a lot of the support connection stuff is about working on behalf of your participant and working with your participant on the same lines as an advocate would. It fits very, very well. I guess a good outcome for us is to see someone build the capacity that they can make those decisions and choices and they take full control of their NDIS plan. So that’s a good outcome for the support connection that we do. We have now 90 people who provide support connection or coordination of supports for. I guess on an income factor that’s made a significant impact on our financial status. What it has done is it’s given some surety to our NDAP side of the business where we have been able to increase our advocacy side of the business as well. The NDIS side has absorbed a lot of the costs such as rents, phones that type of thing. It’s been a win win I guess for us. The other thing with the complex stuff we won’t touch it – sorry we will touch it if it suits. If there is stuff we recognise that we’re not the best person for it, if we’re not the best person for it we’re not going to pretend we can do that. It’s the same as our advocacy side, we will refer people on to a better or more appropriate service. I guess agencies have to decide whether they go down this line. I think it’s a positive move for us. I think it sits very well with advocacy. Is it pure – I don’t know. That’s got to be up to each individual program or service to make that decision. It’s a little bit different for us in the country because we haven’t got the services or the supports that people have in the metropolitan areas or the different advocacy services. I’m not saying we’re a one stop shop but it allows us to I guess empower more people by providing a second string to our bow and as I say it’s been relatively successful for us. We haven’t had a complaint let alone a conflict of interest yet. I think it’s something that each advocacy agency should look in to. As I say it might not be for them but it’s certainly something that you can think, I think advocacy services are well placed to be the best providers of this particularly line item support coordination and support connection. I think also the work has helped us. If we had been an advocacy organisation and hadn’t done this other work we wouldn’t have the understanding we now have of the NDIS. We understand the planning process. We understand what support connection and what other things are and we know how organisations should be doing it. Even our advocacy arm has benefited. They will come across sort of our advocates and ask our Green Pie people – is this new, they will ask for new information. That’s okay we can share information across the teams. Not confidential information but information about the NDIS and how it’s operating. That’s only been a bonus for our advocacy clients because often I feel that advocacy is shut out of a lot of the new things. You get a new employment policy, whatever, all of these new things happening sometimes and you’re not quite there because you’re not living it and because really you don’t have the time and resources to invest in finding out how they’re doing these new systems. For us it’s really been a big help to our advocates as well and our board of management which they then pass on to others. It’s actually been quite good for the whole organisation to get a better understanding of this beast, which we’re all going to have to live with. There has been some great advantages for clients and participants. I think the conflict of interest policy we will delve a bit deeper. We developed a separate policy manual for Green Pie. We adjusted our governance policies and our conflict of interest policies. We don’t promote Green Pie to our advocacy clients. We keep them separate. If a Green Pie client requires advocacy on any matter we refer this to another agency. We don’t advocate. But we’re in Geelong, we have the benefit of that. Colac, further out, it’s going to be different in Melbourne as well. It really has to be adjusted to the agency. We probably feel in a way because we were the first one we probably went overboard with conflict of interest but we felt we had to do it that way. We will adapt our policies in time as new issues emerge and as we get more mature in our organisation and the sector becomes more mature about that. Our number of audits has significantly increased. We have NDAP advocacy but in a different region. Our NDAP advocacy is not where we operate Green Pie, it’s in a different geographical area it’s Bacchus Marsh and Golden Plains. We do that in a partnership with Grampians Disability Advocacy. So we have no conflict with NDAP and Green Pie. But we do provide stated advocacy in Geelong where we have Green Pie. We’ve passed every audit according to the national standards in both advocacy and Green Pie. We’ve had a validation audit, which is another audit the NDIS introduced on Green Pie. This year all in all, in this 12 month period we’re on our third lot of audit processes which is too much but it’s the way it’s happened because one is in a partnership with NDAP, one is state funded advocacy and Green Pie and another program. Our auditor has looked at our conflict of interest policies, our policies and said they’re excellent, there is no cause for concern there. I think that’s all you can do build up your policy development if you’re going to enter this area and work out what suits your organisation in the area that you’re in and the climate that you’re in. Just in general we’ve seen a lot of good things come out of the NDIS. There has been a lot of policies. I guess the rules changed three or four times. A lot of things disappeared as well in peoples packages however it’s important for people to be able to negotiate properly. With that support that’s where advocacy is very, very important for people who are going into the system. As I said before we were inundated with requests for service. I guess the hardest thing is to get your head around how the NDIS works, what it funds, what it supports and try to get in there and get the best deal possible for people who are coming on board because there is a lot of rules and regulations. It’s not as simple as just turning up and telling them what you want and they give it to you. But at the end of the day we’ve seen some terrific things come out of it. Some people have really benefited from it. A couple of drawbacks – people who get supports to engage more in the community, one example was a young person in a nursing home. He got all these supports however he never had the financial ability to use his supports because it was engaging community and of course when you’re engaging community it costs you money. He had all the support hours from staff but even a cup of coffee because most of his income was taken on his accommodation. That’s the sort of systemic stuff that we can also report back to the NDIS to say this is having a pretty big impact emotionally on this person because all of the sudden he can get out of this nursing home but what is he going to do – sit in the park every day? Maybe he wants to do that but it was designed to new experience and get some social engagement. There is still some pitfalls in it and I think once the advocacy sector gets more involved we can drive even more change. I implore you to get on board. Carol it took us a while to become registered. The registration process isn’t as easy as filling out a couple of forms. You really have to go in and prove you’re able to do it, got the expertise. You’ve got all the bells and whistles, you’ve got to tick them off. One new program in Colac applied 8 months ago and just got their registration through. This is for a respite service I think. There is going to be a hold up and as it rolls out I assume there will be more hold ups. The plans have certainly ground down to a screeching hold in Barwon because of the roll out. We have people who applied 8 months ago and still haven’t come onto the system. There is a few pitfalls and as Christine said they’re going to roll out 12,000, well that’s going to be an enormous job for support people and advocates to try and ensure that the people who they’re supporting are really engaging with the scheme and getting on the scheme. It won’t fund things like health, it won’t fund things like education. If a child is under the age of 18 years living with his or her parents, things that a parent is normally responsible paying for it won’t fund. There is lots, and lots of things within the scheme that really if you delve into it there is also some stuff that we need to know and make people aware of. But overall I must say it’s great to see people who now are getting around in motorised wheelchairs/scooters who wouldn’t have had the capacity to do so financially. People who are working now. There has been a lot of good things happen but still a long way to go. It will be great to see more agencies like ours come on board and I hope really provide that support and that independence. I suppose we could take some questions now. That was really helpful, thank you for presenting. I’m from the Youth Disability Advocacy Service and we’re on the journey that you are currently sort of at the end of. I’m very interested in this idea of setting yourselves up with a separate arm. I’m interested in how, would you do that again if you had the time over again? What things might you have done differently and also if the manager or the CEO, or the EO is the same person, how does that work from a Government perspective – are there two different boards you report to? I just need a bit more explanation around how a separate arm works. I guess in our situation we have a subcommittee for both. We do have the same board because we are still the Colac Otway Region Advocacy Service. The CO Connect arm is certainly, well we say a subsidiary of that organisation. Is that the legal term? How does that work? We’re a registered entity. Colac Otway Region Advocacy Service trading as CO Connect. So it’s a trading name. Okay but the boards the same. The board is the same, yep. Legally it’s one organisation but it has an arm that has a different name. How about budgets, are they separate? We keep them totally separate. How do you pay the CEO? We only have one CEO. We’re not fortunate enough to have a CEO, it’s me, it’s a manager. For us we do the trading as as well. We only have one board. We have separate bank accounts. They’re all still under BDRC but we have separate bank accounts for Green Pie, two of them actually one high interest and one ordinary. The budgets are done it’s just a percentage of the Executive Officer’s time worked out proportionality and that can vary. There is a little bit of investment required in the beginning before you start getting paid for anything that really you’ve got to take on as an organisation. It wasn’t huge in our case but even what you’re doing now is taking up your time. You’re researching so that’s a little bit of your time. But we didn’t count any of that till Day 1. We didn’t count that I mean until Day 1 of when we got a participant, our first one. Then we started dividing up within budgets. Look it’s not hugely complicated but we run the three different accounts. Our financial auditor seems happy with the process as well. So when we say it’s separate it is and it isn’t but we can’t probably run three different – a couple of different organisations but we can certainly run arms or divisions or subsidiaries, whatever you would like to call it, and we run it that way. From hearing what you’re saying it sounds like NDIS subsidises your NDAP, that’s what you said. I just want to know is that ethical, is that okay when it comes to your finances and are there issues around how I guess you mentioned standard accounting practices, if you’re managing one arm of the service have a cost to dip into that arm? We’ve had two audits, send it off to Department of Social Services they haven’t had an issue with it. We run it as an arm under the (inaudible) you’ve got the advocacy, NDIS side of it. You have the one balance sheet for the organisation then the P&L for both. That’s how we equip for the last two years and it’s been fine. At the end of the day with the Green Pie/NDIS funding it’s not block funded anymore. If you get your $55.00 an hour so long as you employ a staff member for that hour what you make on top of that is yours to do with what you wish. If you pay someone $35.00 and you make $20.00 then that can go towards anything you wish. You’re not indebted to anyone to explain what you do with profit. I mean it’s not huge. Obviously you’ve got overheads like contribution to the Executive Officer and accommodation, all of the utilities, everything that goes with running an organisation. Look ideally if some of the money went back into advocacy and it was extra advocacy on top of NDAP or on top of State funding there is nothing wrong with that. We’re not taking any money out to do anything else. For us that will help support us. There might be lean times, might be times when we want to run a particular project that would be really great, a systemic project and we have no funding to do it – we may dip into that. You’re allowed to do that. But not the other way around. Tasmania there is one or two. And Tassie as well. I think Mary is going to help us facilitate, to get the organisations together that are already doing it and talk amongst ourselves. There might be better ways than we’ve done it. It’s just that that’s how we started off. I probably wouldn’t do it any differently from our perspective right now but I could say something different in 3 to 5 years. It has changed. It’s reinvented. Because all the trial sites were run on different models. Victoria was different to Tassie, different to NSW. They’ve come up with this one model now out of all the trial sites. It’s probably changed a bit since we first registered. I don’t think we would’ve done it any different either. We didn’t rush into it. There was a lot of consultation particularly at board level. The process isn’t quick. That might be something – it may have changed, but you might want to start thinking about it. You can be a registered provider without having any business, doing any business. You can actually be a registered provider. All your money, all your payments through NDIS is GST free. There is no GST in NDIS payments. You said you hire casual staff. Is that problematic because people aren’t guaranteed hours? That’s right. The funding obviously comes with the person. You can only guarantee hours with the amount of people that you’re actually supporting. Unfortunately that’s going to be the new way – we found it down there that most people now working in the disability industry, are more casual. What do you pay people, what percentage do you pay them? If you had $55.00 an hour how much of that do you pay them? It varies on qualifications. We don’t bring people in without any qualifications. We’ve got people here who have their Certificate 4 in Disability as a minimum, that are working. The staff know that they have to be on the clock very much most of the time of that $55.00 an hour for us to get any financial benefit out of that. But in saying that you’ve got to also be mindful that even a phone call for 10 minutes, needs to be charged out against the person who you’re working for. If you don’t charge for I think it’s between 95% of the time you’re not going to make any money out of it. It’s not going to be sustainable. You have to get those practices into your staff and ensure they are aware they’re basically on the clock all the time. $55.00 an hour isn’t a lot. I think there is going to be a 2% increase. That’s what I am trying to understand, how do you work out, you said you use that money to subsidise other areas. Put it this way I reckon if you were doing it with two people you would never make money out of it. The more people you get through obviously there is going to be benefits because the $90.00 or $95.00 there is a lot of work in those because there are some complex things. In saying that we were dealing with them through the advocacy stream where we were getting nowhere near that. I think if you equated the hours you put into the people using the advocacy service, it wouldn’t work out at $55.00 an hour I would tell you. It would be a lot lower. It sounds like it’s a good deal but it’s not a good deal. You’ve still got to make a buck out of it. Do you recommend people do the support coordination as well, the lower end? We just want to get a microphone over to the other side of the room as well. I did see your hand up. The $55.00 is that a budget proposition, can you make money out of that $55.00 an hour? As long as the staff are on the clock yeah. I was going to ask what is Green Pie and does the Government, are you going to be educating the State Government because I really believe that people like Martin Foley still do not understand disability? I don’t think you will get any argument there. Green Pie, is Carol’s NDIS arm of her service, BDR I should say. It’s just a name Green Pie. Just the name of the organisation we’re using to provide services under the NDIS. Are you educating Martin Foley, because I think he needs to be more educated? That’s probably a systemic role for the sector and something that could come through DARU. There are a lot of advocacies out there that don’t understand what they’re doing, are a little bit unsure. That was excellent, great. It’s really good to hear both of you describing the process you’ve been through. A couple of things George when you were asking the question and you used the term subsidising, like cross subsidising from one part of the organisation to the other – what struck me is that heaps of the NDAP funded organisations actually get State funding from around the country. Well more than half of them do. Those organisations already do that all the time, not the cross subsidising but they allocate. 20 hours of their manager’s time is funded under NDAP and 20 hours or whatever funded under their State funding. They have to equip them separately, the rent will be shared across all the overheads. For lots of organisations they’re doing that anyway all the time and if they get a project they split some of the overheads across. It’s only for organisations that only have one source either NDAP or the State Government funding that this idea is a bit new to. I reckon for more of the advocacy organisations they’re already doing this anyway. This is a new way of thinking about it. It was a good point you made about the complexity of the stuff you already do in advocacy. Some of the stuff that’s described at the highest level of specialist support coordination, advocates are currently doing it for free. Not for $170.00 an hour. That’s right. I was interested in that because what I thought I had been told about that was that you needed a psychologist or somebody with that level of qualification, a Masters in disability education or something to be doing that $170.00 odd one. But anyway, a lot of the work inside that is being done by advocates who are not being paid that kind of money. That’s an interesting thing. The management of casual staff that’s one of the things that strikes me as being very different. Personally I don’t see the conflict of interest thing being such a big thing and I have to say DARNA is in effect sitting on the fence at the minute around it. There are DARNA members, like you guys are already doing this stuff, and others that are rapidly moving towards it and then there are other advocacy organisations who feel – it has been expressed to me that they think that’s like being a traitor to advocacy in some way. They feel so strongly about staying clearly within the boundaries of black and white, pure advocacy and this stuff is service provision. I think there is a challenge ahead of the advocacy sector, which is different from individual organisations. Individual organisations their boards have to think about it, make their minds up work out what they’re going to do. But the advocacy sector as a whole has to somehow find a way of trying to collectively make our way through this without the sector killing itself. It’s a worry for me viewing it from the overall perspective. It probably become clearer for us. We did have the same concerns. But I think once we got in there and got our hands dirty it became obvious to us it was a good fit. Particularly support coordination is a really good fit. We were inundated, absolutely inundated with requests and we never had the capacity. We could not meet demand. By doing this we’ve ensured that we have met the demand in a manner that we’re able to help those that come through the door looking for that. I can tell you our advocacy numbers for people coming in looking for advocacy haven’t dropped at all, they’ve maintained. I agree that NDIS should not provide funding for advocacy because not everyone is on NDIS that needs advocacy. There is a lot of people that still require advocacy support that do not get funding. I think it goes hand in hand. I understand what you’re saying Mary and I know there is people out there that probably will take a lot of perhaps convincing. Maybe we’re wrong, who knows. We may be wrong the way we’re going but my gut feeling and I think it’s backed up by what we’ve been able to achieve is it’s been successful without having too many issues around conflict or a like. As I say it’s up to each individual board. Country again is different to city. Regional, rural, isolation there is lots of factors to take into account. I think it’s well worth everyone, each organisation having a look at it because it might not work for you but I think you will find there is a lot of similarities and a lot of compatibilities in what the work is. Thank you for taking the time to come today and I appreciate your openness. I’m Darryl, Program Manager from Rights Information Advocacy Sector in Shepparton. I am also listening and hearing with open ears, open mind. Really two questions. One if have you had a situation where an advocate is actually sitting with a client whose actually sitting with the Green Pie worker? Not with my experience in Colac. Not for us either. I suppose the only circumstance we’ve had is that I think we had an advocate at a meeting, down at Geelong, and the NDIA looked over at the advocate and said perhaps Green Pie could do that. The advocate said no I’m here to advocate for the client, that’s nothing to do with me you need to ring the number and do in take through Green Pie if that’s what you’re interested in. That’s how she handled it which I thought was really good. She came back and told me about that and I thought that’s great. That’s really the only remote example. I think look because I’ve been working in advocacy for quite a long time now, I had a client some 15 years ago and she walked in the door as soon as this hit and said I want BDRC to help me with my plan management and I said you realise that – and we explained to everyone that it’s BDRC and we do this and do that and she said I haven’t had advocacy for 15 years so I’m not really an advocacy client but as soon as I saw you I knew it was an organisation I could trust and I don’t want to go through my service provider. I suppose they’re the only two examples I have got which are fairly far flung but we’re ready. Obviously we know of other advocacy organisations in our region whom we could refer to and we’re perhaps lucky in Victoria that we do have the ability to refer to other agencies should that conflict arise. I can totally relate to your comments around the country area, the geographical isolation as such brings. Lastly I guess my question is who finally makes a decision around is it a conflict of interest? Is that independent or is it part of your organisation? I guess are you talking on a day-to-day basis? Part of our quality assurance, we get audited. We have to if there is any issues within our organisation we have to log them or whatever. We have to prove there hasn’t been any instances of conflict. Participants are given all the information in regards to how to make a complaint if they need to and our advocacy organisation isn’t on that. Also NDIS put out a how to make a complaint. We try to steer people away if there is a complaint. Again, if someone is not happy the normal process is sit down and try and sort it out which is quite the way to go. At the moment touchwood, we haven’t had that arise. We have referred people on to RIAC in Geelong. When people haven’t been able to get on to the NDIS system they take it up on the participant’s behalf. In general no, we haven’t had an issue. That’s not to say there is but we’ve got the policies in place to deal with it. We had to get them in place to get the accreditation, our registration. Hopefully that never happens but you never say never of course. I’ll hand over and finish at this stage but three audits in one year? That’s Carol. I had two we had the NDAP one and the NDIS one a month ago. The guy that did the NDIS one didn’t have a clue. The NDAP one, it’s all new even to the auditors. There has been some variances even the way it was conducted. It’s almost a full time job for someone to just manage the audits. I don’t know why they don’t have one set of standards we comply to. They do have one set of standards now but they insist on auditing separately. That’s one of the things in Victoria I think, DHSS still manage quality assurance. The other States they don’t. I guess the safeguards are probably doubly assured in Victoria. That’s right it’s not cheap. I think also explaining to auditors what we do – we don’t provide service, we provide a service but it’s about support connection or service intermediary or whatever. We don’t provide a day program or respite or whatever. The auditors have to come to an understanding of your organisation to be able to then audit it. They’re not quite there yet understanding NDIS and how it works. It’s an education process for them as well. Are there any other questions for Paul and Carol? You mentioned audits. My understanding is that the DHS standards are what the NDIA will look like. Are you saying that you still have to have another audit regardless of the fact that you already are found to be compliant? Yeah every 12 months, it’s the same. So for us we’re audited against DHS standards and NDIS and the National standards for both advocacy and for our NDIS services. I’m not sure how we got into that position but that’s what’s happening. I don’t think you need to be. It’s a cost we can do without. We also had this year what is called a validation audit, I might have said this earlier. That’s like an NDIS random audit. We’re going to audit you in two weeks so off you roll. They came and really what they wanted to know was what we had billed for, what we had claimed or what we had – there is a portal to do with the NDIS. What we had claimed on the portal and meet exactly the same as what is in a person’s plan and what we ought to have claimed. It wasn’t really a financial audit. It was a little bit of that. But we sort of had to educate them that we actually don’t provide that service. We do do some financial intermediary so others provide that service and we help them with the management of that. There is a portal that you can go and claim your funds. It’s usually a two or three day turnaround of a pay into your bank account. You don’t get money up front. You have to submit a claim. You have to provide the service but it’s very quick. That’s a big impact on large organisations. These massive organisations because they’ve been block funded and had the money upfront, now they don’t get it unless they provide the service. It caused a bit of heartache to be honest. It’s about time they were held to account. It’s user pay. They’re paid for what they deliver. Promise one more question. You’ve obviously been trailblazers in terms of doing this sort of work and I think it’s really important that people have an option for support coordination that is not just a service provider. I am wondering how can other services that are interested in learning from you benefit from what you’ve done and I’m wondering is there a policy and procedure manual available for us to have a look at, is it on the website? I would have to talk to our board about that. Some of it is our own information so it suits us. We would need to have a think about that. I would like to share but it just depends. You may well be our competition. Maybe that’s about DARU supporting advocacy organisations. That could be something that DARU could do. That’s something we will be looking into over the next 12 months. I was going to say I think DARNU are also involved in that process as well. We’re here in a spirit of cooperation. We will work on that. Great. I think it’s time to wrap up for the day. Thank you so much Paul and Carol for speaking to us this afternoon. Been our pleasure. Thank you. As usual all resources from today will be made available on the DARU websites. You will be able to download from there and that will happen in the short-term .We will also send out information either this week, next week, an evaluation form. Please give us your honest feedback. Your feedback is extremely important and it informs our work for the next 12 months. If there is anything you want to see or anything you want to talk about at the next advocacy sector forum please let us know. Thank you all so much for coming out today. I hope you all enjoyed today’s session. Have a great afternoon.